Every DataHub interface can be securely protected from accidental or intentional intruders through the DataHub’s built-in Security feature. User name and password validation keep your data and configuration securely out of reach of meddlers and the malicious. Configure access separately for each protocol: OPC, DDE, TCP, and Tunnel/Mirror (DataHub to DataHub) connections. 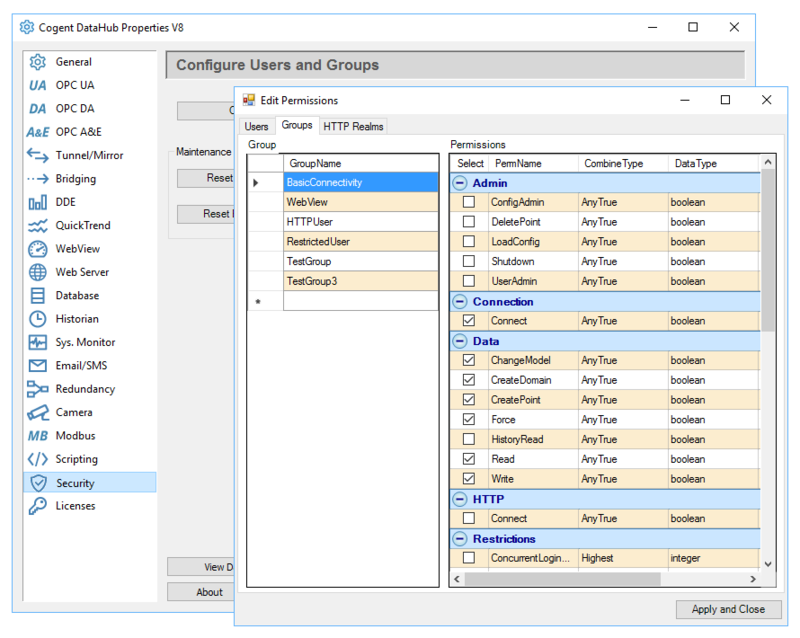 Create custom groups with different permissions, and quickly assign users to them. Set permissions for each type of user activity, such as making connections, reading values, changing values, creating new points, deleting points, administrative privileges, and more. Optionally, specify maximum numbers for user logins, and/or set login expiry dates. Security is part of the DataHub Core, and is thus available in all Products.